The bonnet must be closed . Switch the ignition on and then off again. Briefly press down the windscreen wiper lever . Place the windscreen wiper arms back onto the windscreen before driving away. With the ignition switched on, briefly press the windscreen wiper lever down to bring the windscreen wiper arms back to the original position. Move the wiper arms to the service position before lifting . 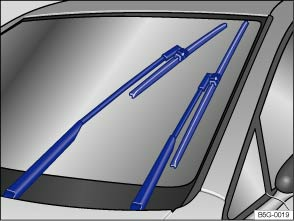 When lifting a wiper arm hold it only by the wiper blade mounting. In order to prevent damage to the bonnet and the windscreen wiper arms, the windscreen wiper arms should only be lifted when in the service position. Always return the windscreen wiper arms to the windscreen before starting your journey.